For the final one of his “Christmas Books,” Dickens returns both to Christmas and firmly to the supernatural. If The Chimes is a morality play, The Cricket on the Hearth is a romantic comedy, and The Battle of Life is a soap opera, The Haunted Man and the Ghost’s Bargain is an episode of the Twilight Zone. It’s a well-done, if straightforward, “be careful what you wish for” tale. The story follows Professor Redlaw, who is said to look “haunted.” He was wronged as a young man when a friend married his sister, leading to her death (I think - this part of the plot is fairly vague), and he thinks constantly about this. One year at Christmas, a phantom who looks like his dark reflection appears to him and offers to take away his pain by removing all memory of sorrow and wrongs. Redlaw takes this bargain, but the phantom adds that he will also lose all memories connected to the sorrows, and that he will spread his condition wherever he goes. The next day Redlaw goes out to visit a student who is ill. However, when he comes within touch of the parents of the large, kindly family the student is lodging with, the parents cease to care for each other or their children. The student first begs Redlaw leave him alone and not to show him pity, as he is the child of Redlaw’s lost sister. Redlaw has no real memory of her, though, and soon changes the student as well, causing him to be ungrateful and resentful to anyone who is kind to him. With some idea that his condition is now a curse, he returns home to the one person he has seen and not affected: a young boy who the school caretaker has taken in. This boy is nearly a feral child - with no memory of kindness or love, he is also unaware of sorrow or wrong. Redlaw asks the boy to take him somewhere he can find people who are suffering from extreme sorrow (thinking that his curse might be a blessing for someone), and the boy leads him to a run-down building. In here, a man lies dying, attended unexpectedly by the school caretaker and his aged father. The dying man is, in fact, the old friend who wronged Redlaw the most, and he apologizes most humbly. However, Redlaw’s curse spreads to all of them, turning them selfish and cold to each other and the world. Redlaw flees home again and begs the phantoms to remove the curse, if not from him, than from the innocents who did not ask for the bargain. The phantom reappears and implies that the caretaker’s wife, who Redlaw has been at pains to avoid, can help. The next morning it turns out to be true. As she visits each afflicted person, they remember themselves and regain their senses of joy, kindness, and compassion. It is revealed that she lost a baby many years ago, and instead of making her angry and bitter, that sorrow caused her to be more sensitive and compassionate toward all people. Redlaw himself is finally healed and reconciled with all the other characters, and they hold a Christmas feast. I think this story was shorter than the rest, although it did still drag in parts. Particularly in the beginning, there is so much description and so many side notes that I kept losing the thread. Also near the start, the characters of the caretaker couple were called by their first names, last names, and nicknames so interchangeably that I had trouble following. However, once past that section, this was probably my second favorite of these stories. 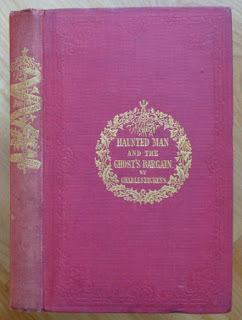 The ghosts are well described, the twists well delivered, and the Christmas connections sturdy. It’s interesting that in the final one of these stories, Dickens returns both to ghosts and redemption. The characters in this story learn that remembering sorrow makes them who they are - and that Christmas is a time to remember that sorrows and troubles can be forgiven and mended.